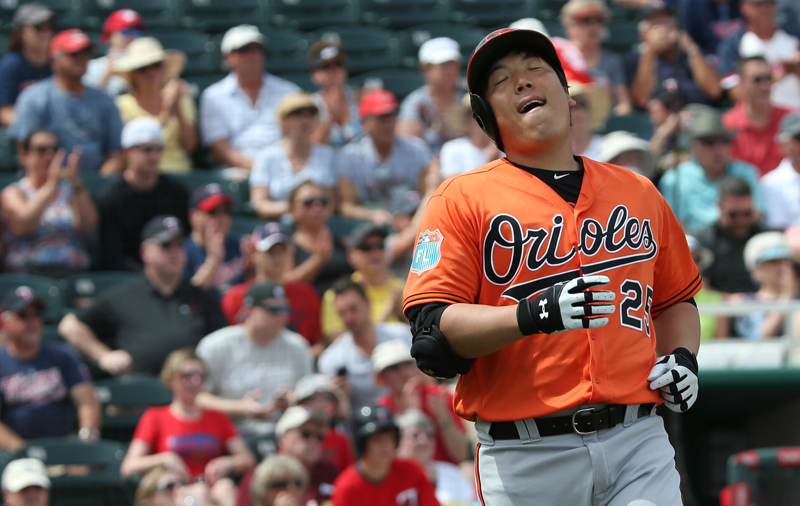 Kim Hyun-soo has been less than impressive for the Baltimore Orioles this spring. South Korean outfielder Kim Hyun-soo went 0 for 3 Friday and he may be running out of time to make the Baltimore Orioles’ Opening Day roster. Against the New York Yankees in Florida, Kim grounded out to third, grounded out to first and flied out to left to snap his second three-game hitting streak in eight games. He was then replaced by Nolan Reimold, who promptly went 2 for 2 with a home run and two RBIs to lead a dramatic 10th inning 11-10 comeback win for the Orioles. The 28-year-old Korean left-handed hitter has been less than impressive this spring, in all honesty. One can make an argument for his .186 batting average, had he been hitting the ball with some authority and finding other ways to get on base, but he has no extra-base hit to speak of after 43 at-bats and only one walk (after walking 101 times in Korea last year). The Orioles had signed Kim to a $7 million contract over two years, hoping to fill one of the corner outfield spots, but they haven’t been impressed with his defensive skills either, making it difficult to justify giving him a roster spot. The Orioles can ask him to go down to the minor leagues to better prepare, like they did last year with Korean pitcher Yoon Suk-min, who never made it back, but Kim has the right to refuse minor league assignments.